This cheery building sits at the top of Gorleston high Street, not far from the more famous Catholic church by Eric Gill. Methodism seems to have been a considerable enthusiasm of the Gorlestoners, and the 19th century saw a great deal of splintering and reforming among the three main strands of Methodism. 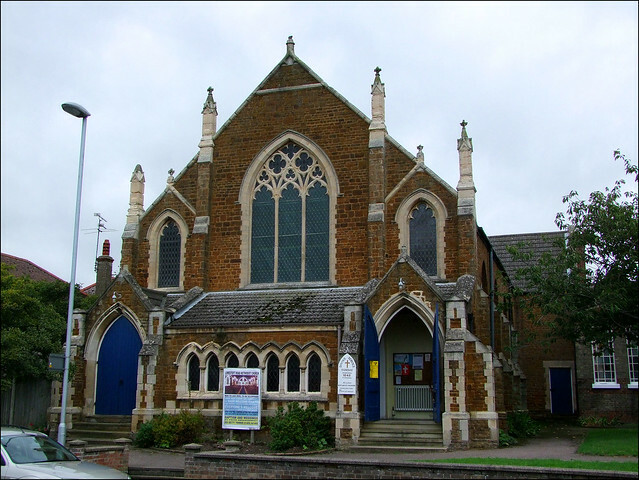 The banded brick hall to the north was an earlier church, built in 1865 for Gorleston Wesleyan Methodist Society as Lowestoft Road Chapel. It was paid for by a wealthy London Methodist called Francis Lycett, who gave £6,000 (just over a million in today's money) for the construction of Wesleyan Methodist churches in the Yarmouth area. £500 (£100,000 today) went to the construction of this chapel, and you can still see Lycett's name on the foundation stone. The architect was a Mr J Bottle. The rather more splendid and extravagant replacement church opened in 1899, to the designs of William Cockerill, the Great Yarmouth borough architect. It is fully of its decade, and a reminder of how non-conformism had fully embraced the Gothic of its Anglican cousins by the end of the century. The material is principally carstone, with freestone used for those extraordinary spirelets. The two buildings make a handsomely odd couple. Inside, the 1899 church is light and clean, the blue carpet matching the ceiling and otherwise an overwhelming feel of polished wood. The great treasure of the building predates it by more than a century, for here is the pulpit used by the great John Wesley himself when he preached at the Rows Chapel in Great Yarmouth. The stained glass behind the holy table, depicting Christ suffering the children, is pleasant and not intrusive. All in all, the interior is less spectacular than the exterior, which is probably just as it should be.